Registration for the founding member plan is currently open. General registration -- and the other plans -- presumably will be available soon because CDTA is projecting the bike share will start operating by the end of July. CDPHP Cycle will include 160 bikes spread across 38 stations. Next year, CDTA is planning to add an additional 20 stations. So no leisure rides. For a 72 hour pass in the city is 24 dollars. I would easily bet the people that put this together never did the social math or cared to. This a shame for something that could have been nice for tourist and the people of these citys. It feels like the pricing is setting up to fail. Albany is notoriously not bike friendly to begin with. Also not stated is how much this affects people that can not put down a deposit. So it cost in one week at an hour a day to buy a bike of the same quality. The only people that are going to have access are only a small amount with the means to use it in the city. I would easily bet the people that put this together never did the social math or cared to. This a shame for something that could have been nice for tourist and the people of these citys. 100% agree with Joshua. I realize the capital region isn't the same layout as a major city, but I still don't see why the standard pricing structure isn't followed. A nice new amenity, except for the rampant language debasement it has inspired. So ask yourself: are Hertz, Avis or Enterprise engaged in "car sharing"? 'Nuff said. 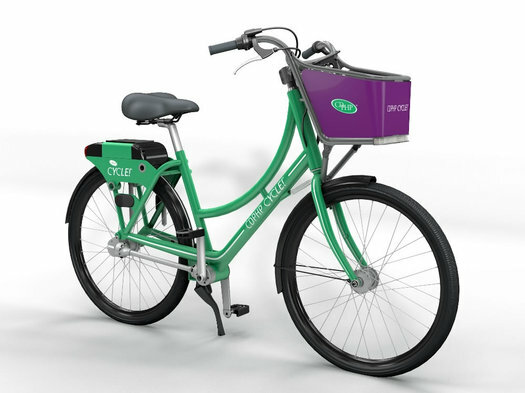 This is basically a new, more convenient form of bike rentalâ€”subsidized by CDPHP, smartly seizing on a sponsorship marketing opportunity. The pricing seems reasonableâ€”although electric boosters would help in hilly downtown Albany. > So it cost in one week at an hour a day to buy a bike of the same quality. 7 days x $5 = $35. If you can get a functional bike + u-lock for $35 then you should set up bike shop and make profit. This is for get from point A to point B and end your trip. Do what ever your doing, then start a new trip to get home. Even at a slow pace you can now cycle 1-2 miles in 10-15 minutes for less than a bus ride (trips are pro-rated per minute). IMO in this Region, too often, change is thwarted by naysayers who actively block new or different things that are merely good but less than ideal. I am kind of confused. These rates seem slightly lower to a fair bit lower than the rates I have seen in big cities, (For example, in the Twin Cities, there are usage fees even if you are a member. The maximum daily usage fee is $65.) but based on the comments above, I think I am missing something. My first thought is that these prices were extremely reasonable if you join early. $105 for 90 minutes of riding every single day for the next two years... it would take only 25 rides over those 2 years for it to have been worth paying for a membership vs a hourly fee. errr.. I mean 21 rides. The one thing I don't like is the out of system fee. I realize it's necessary to keep the bikes close to where the racks exist, but it makes something like a ride to the Spectrum to see a movie and a ride back impossible... at least without incurring a $25 fee in the meantime - and potentially losing your bike during your movie. @Susan - the base fairs and membership rates are fine. most programs I have seen include an *unlimited* number of rides, so long as the total time for any individual ride is less than a certain threshold (typically 30 min). I agree that overall this is great, but still, I don't understand the pricing structure. I'm also not convinced the ability to leave the bike "anywhere" within the boundaries of the district is a net positive for the network. I wonder if that has something to do with the pricing structure they arrived at. Better hub locations (albany is mostly fine and schenectady is just OK, but saratoga is limited and troy is pointless) would alleviate any such need. Guessing the ability to leave the bike anywhere is a concession to the fact that people will leave the bikes wherever they want anyway. I think Joshua's reservations are the real issues here, not the pricing structure (though his math is a little off). If they're just trying to reach tourists and the middle class upward, fine. If this is meant as an integral part of public transit for the entire community, you have to have solutions for those without bank accounts. Also it would be interesting if any CDTA bus with a bike rack would be considered a hub but I imagine all the involved logistics are nigh-unworkable. I'm guessing the roll out while be two pronged, with the first prong aimed at the recreational/tourist market. The second prong will be geared towards those who would utilized the bikes for commuting and/or business. Don't quote me on it, but I believe several leaders involved in this, to include CDTA, mentioned that the goal is to tie in the CDTA "Navigator" card (that CDTA is now more rigorously rolling out after a year or so of testing), where your monthly bus pass would apply towards using the bikes too (aka, I commute into Albany from Schenectady, unlock a bike at/near by stop and bike the remaining distance, especially when busing doesn't make sense). With any system roll out, there will be kinks and it often makes sense to implement in phases, otherwise you get swamped by the minutia of adjusting to too many unplanned problems. I think you're right Rich, and that all makes a lot of sense. This would be perfect use for the navigator card. On re-reading, my above comment might sound too cynical; on the whole I'm glad that CDTA is experimenting with this and look forward to seeing how well it's adopted. I'm liking the idea behind -B's comment that a CDTA bike rack would be considered a hub. there would be logistical issues, but likely could be problem-solved away---good creative idea! Buy a cheap bike and use CDTA to get it to the area you want to be in. You will save money and own a transportation asset. Good points all around. Making CDTA buses into bike hubs is really disadvantageous to people who want to bring their own bike on the bus, only to find it occupied by a "returned" share bike. Maybe instead, the bike share could simply not charge for time aboard a bus rack. I still think the "leave the bike anywhere" model is pretty absurd in the long run. Perhaps one short-term benefit would be in planning future hubs based on non-hub drop-off concentrations?